Last edited by Rutger on Tue Oct 30, 2018 3:14 pm, edited 3 times in total. Ah cool didn't see that one. I just did my daily Ebay check and saw these newly listed. I posted about it a little over 2 weeks ago, but back then we didn't know the model numbers etc. But it was very likely it would copy the PM2 version. I think this model will be quite popular and deserves its own topic. I've been wanting a Cruwear Para 3 but the old run from 2017 is going for crazy prices these days. 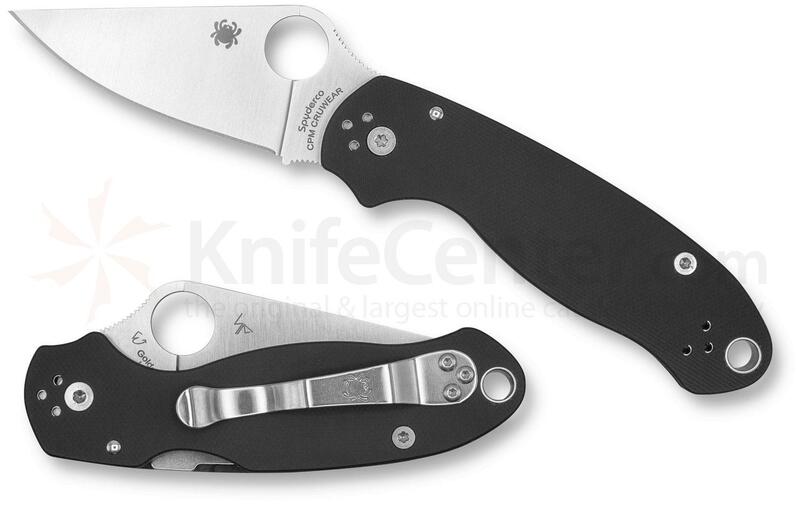 Off topic related to the CruWear Para3, but since you mentioned it: Pretty sure I've seen offerings of the combo edge 52100 Para3 on the bay. Check National Knives there. I wonder if they will do a pre-order set up or just a buy it now? Definitely in either way. I've got the first light gray cruwear sprint and it is fantastic. A backup CruWear para 3 certainly wouldn't hurt. And strange enough I only own 1 black handled knife, my first one, a Byrd raven 2. I prefer the PM2 generally, but a Cru-Wear Para 3 would be a nice addition to the family. Looks nice, I've got to keep my eyes out for this one! Yeah I think I need one of these. Oooo I can't wait. Definitely getting one. Thanks for the heads up! I think I'll pick one up but so far KnifeCenter has yet to deliver on any Para 3 Sprints for me. Nothing to gain here already having M390, M4, 4V and Rex45! Finally a newly released Para 3 I can pass on. Wow..spyderco is not wasting any time this year pumping the Para 3s out! Love my PM2 version of this knife...so it's a must for me. Between this, CSs XHP P3s, the DLC Jade military , and the Rex 45...I'm in for a few more knives! It's a KC exclusive. So if you get on their pre-order list earlier enough it should be pretty easy to get one. I've done a whole bunch of pre-orders with them for sprints and exclusives. They haven't let me down yet. I have the grey Para 3 Cruwear. So I'll sit this one out like I did with the KC PM2 Cruwear. Last edited by Sharp Guy on Fri Oct 26, 2018 3:33 pm, edited 1 time in total. I waited 7 months for a Maxamet and they finally canceled my order. Same with a couple others. Other than that they have been good. I probably buy more from then than other dealers, but the Para 3s have not been kind there. Pre-order is live. The description is showing this as a 600 piece limited run.